A while back I was asked to create a few paintings for the amazing composer Michael Giacchino who did the music for LOST. The concept was to paint the connection that lived between the music and the show. Being not only a HUGE fan of the show, but also a BIG admirer of Giacchino's work the request was a dream job. As the concept developed, I really wanted to showcase the "moment from the show" as if it were a play, with the orchestra filling out the edges of the scene and fading away into black. The music is such an important part of the show, that I wanted the orchestra to feel as though they are part of the cast and set, playing in the scene with the characters from the show. For style I kept the characters in silhouette to create a "likeness" of who was there in the scene, but with the idea to focus more on the "moment from the show" rather then illustrated caricatures of the cast. I kept the color pallet simple, kept the lighting bold and took inspiration from Mary Blair's island paintings from Peter Pan. 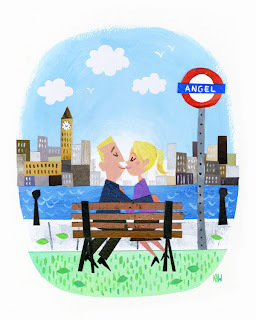 Here is a painting I recently did as a Wedding Anniversary Gift for a couple who met in London.